Sorry Instagram users, but the grace period following Facebook's buyout is all but over. Ads are invading imminently and today we got our first glimpse at what we can expect from the commercial interruption. In a post on the Instagram blog, the photo sharing app said photos and videos marked as 'Sponsored' will start to appear in feeds in the US next week, beginning with a small number of brands already using the app. That could mean a number of things, but it's likely the ads will have some sort of faux artistic merit and deploy the famous filters, frames and blurring tools. Interestingly, the company will tap into a user's Facebook likes and their basic profile information to determine which ads will display on that individual's Instagram feed. However, those who aren't connected through Facebook won't avoid Instagram ads. The company will make use of previous Insta-likes or, failing that, just throw stuff at your wall and see what sticks. "We want to show ads from businesses that are interesting to you, and to do that we will use information about what you do on Instagram and Facebook [our parent company]," the company said. "For instance, this might include the people you follow and the photos and videos you like on Instagram, and your interests and other basic info on Facebook." 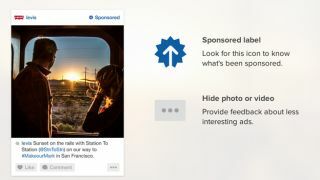 In somewhat better news, users will also be able to hide ads from their feed (not without seeing them first, of course) and offer Instagram some feedback on why they don't want to see anymore like it. In its blog post the company wrote: "If you see an ad that doesn't interest you, you can tap the '…' below it to hide it and provide feedback about what you didn't like. This will help us show you more interesting ads in the future." Have you played around with Video on Instagram yet? These were our first impressions.